I rode into the international terminal and was told that regardless of the weight of the scoot, for my trip to Australia, I had to check my scooter. So I picked it up in Sydney in the oversized baggage area, then rode with my bags to the domestic area, and again they took it from me in the baggage area on the short domestic trip to Melbourne. The next plane ride was to the small airport at Hamilton Island. Melbourne domestic let me ride it to the gate, and they brought it out for me at the bottom of the stairs at Hamilton Island. Ditto the trip back (the stairs were doable going up as well, thank goodness). The way back I was luckier, and once they had someone inspect the scoot and the battery, all I had to do was disconnect the battery and the let me take it to the gate in Melbourne, and then again in Sydney, but when I arrived in San Francisco, they held it til I made it thru customs, so I was in another wheelchair, driven by a stalwart helper (as I have traveled in the past, before Scoot). The take-away message: it may or may not go as hoped, but it is worth the try. 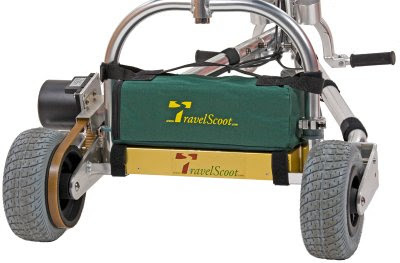 Some airports wanted me to take the battery completely off and put it into the tote bag purchased from the TravelScoot website, but attached to the seat stem of the Scoot. And it didn't seem to matter if I folded down the handlebars or put the cover over them. in fact, it may have been easier for them to wheel it around if left fully up. who knows. 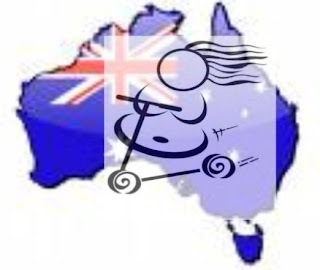 it also helped to convince the Australian folks that it was light when I was able to say that even with both Lithium batteries, the ensemble was less than 20 kilograms. that really helped. Elizabeth and her TravelScoot are flying! I'm leaving Tuesday for trip to Washington, D.C. for the 40th Anniversary NAAFA Convention. It will be my first flight with my TravelScoot, and I'll be flying American Airlines. 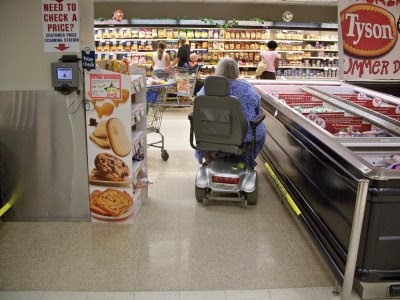 I recently researched AA's wheelchair and scooter policies, and created a blog post about it here. Last night I completed American Airline's Disability Assistance Form. Today a very friendly person from AA called me back. She thanked me for completing the form, because it gives them an opportunity to be prepared for my needs. When I filled out the form I put comments about the weight of my scoot. She noted that when I called, and she asked about the type of battery it uses. She said that I would be able to gate check my scoot (take it all the way to the door of the airplane). She asked that I check in 90 minutes before my flight, and before the plane lands on any leg of my journey, remind the flight attendant that I need my scoot to be waiting at the gate. She also asked if I would need assistance on the plane or if I just used the scooter for the distance. I don't need assistance, but thanked her for offering it. 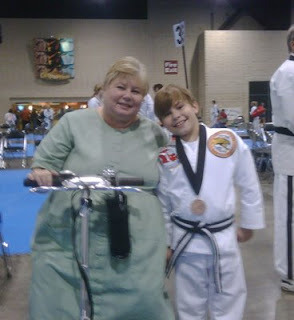 Rhonda sent this to me after her weekend at the taekwondo event in Birmingham, AL. 1. People really don't care that you are on a scoot, they will walk across your path, stop in front of you, run right into you while you are sitting still and act like you did something wrong and most important, think that you can somehow step aside when the two of you meet. The scoot is not the problem, I noticed people in wheelchairs and on crutches being treated the same way. 2. If people are staring, it is because they think its cool and are considering how they could use it to: __________________ (fill in the blank), but will never admit it because they think people may stare at them using it. That fixed stare and far-away look in their eyes is them visualizing themselves with the breeze blowing through their hair. 4. It is like the Pied Piper for children, they will chase you and ask all kinds of questions. Children don't care who might see them, if you offer a ride they'll take it. 5. If you get up to sit in a chair, someone who is curious will ask if they can just sit on it for a while, but you could never get them to ride it. 6. I won't ever take a trip again without it. I'd like to add that it amazes me how many teenagers also find it totally cool and want one. I think it's because they grew up riding 2-wheel scooters and the TravelScoot looks very much the same, except it's got a seat. It also amazes me how often I am sitting still and someone walks right into me. I know I'm not at their eye level, but this is a new experience for me! In the picture the tag you see hanging from the front of the scoot is a gate check tag. I got brave yesterday at my primary care doctor's appointment. After telling him about some of the pain that I am having, he asked about daily mobility. He wanted to know how much walking I do in a day and when that walking causes pain. I took a deep breath and answered his questions, then I told him to brace himself and I told him about my scoot. He laughed! He said he would not dream of asking me not to use my scoot, partly because he was afraid I would fight him for it but also because I assured him that it has increased my mobility in the places that count. He said my body language turned defensive and he knew I was not giving it up. He actually was much more open minded than I expected. I gave him a card and invited him to check out the blog. I told him he would see positive posts from people whose lives have been changed by using scooters. I guess, heaven help the person who tries to take it away from me. Well, it's not a picture OF a TravelScoot, but I'm certain it was taken by Lynn Ellen when she was sitting on hers. 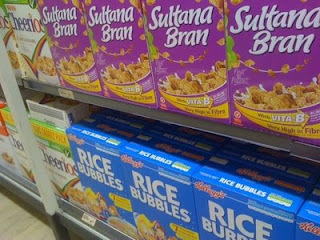 I posted it because it's so interesting to see the names of the cereals. Hardy Huber, TravelScoot inventor, will be at the NAAFA Convention July 31st - August 2nd. NAAFA is a human rights organization for large people that's celebrating its 40th anniversary this year. I will be giving a workshop on Friday at 2:45 p.m. about movement for supersize bodies. The first part of the workshop will focus on exercise. Melissa Taylor Waldron will talk to us about exercise and give a short yoga demonstration. 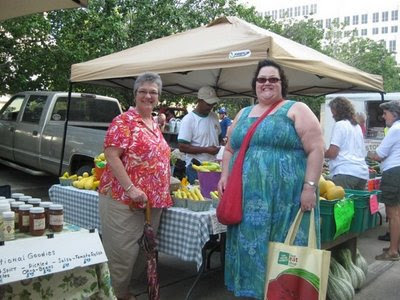 Melissa is a supersize woman who is certified to teach group fitness classes by the American Council on Exercise. 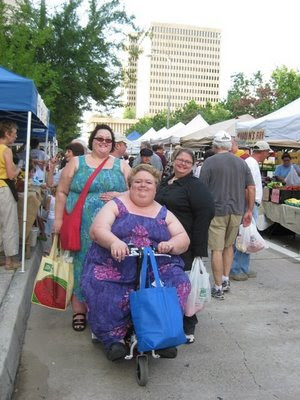 We'll also have supersize women who have worked with trainers talk about their experiences. The second part of the workshop will be about scooters, and how using one can expand your world. Hardy will talk about the TravelScoot and we'll be letting everyone try it out. If you've been wondering if the TravelScoot will work for you, this is a great opportunity to test it out! For more NAAFA Convention information, click here. Look what Rhonda made! 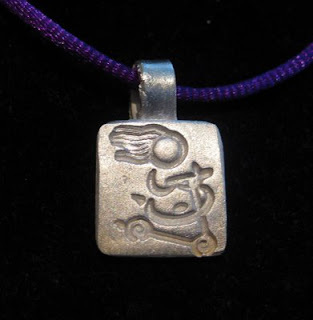 It's a Scooter Babe pendant. Scooter Babe is made of fine silver (.999). Isn't it beautiful? We've been having afternoon rain showers here for the last couple of weeks, so it's not surprising that I got stuck in some rain while shopping at Walmart. It's best not to get the TravelScoot wet, but it was raining a bit when I went to my vehicle so I decided to see how it would work out. I was driving our Odyssey, which was great because I could put the back of the van up and keep me and the scoot dry while I loaded the groceries. I was feeling really brave and decided to go back in the store for more things. 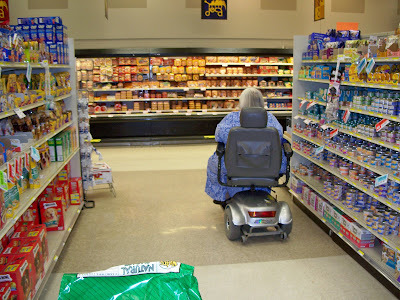 Let me just say that making a 180 degree turn at the same time you're pulling a grocery cart, just starting the scoot AND going up an incline is not a good idea. Especially not in the rain. Yes, you guessed it. My battery overloaded. No problem. I turned around to go back down the same incline I had just come up. I stayed on the scoot, left the battery turned on, and gave it a hard push with my feet. (Thank you Rhonda for the brilliant idea!) Yeah, the battery started right back up. At the bottom of the incline I made another 180 degree turn while pulling a grocery cart, just starting the scoot and going up an incline. It doesn't take a rocket scientist to figure out that, yes, you guessed it -- the battery overloaded again. Now I'm sitting in the middle of the parking lot aisle, wet, laughing, and looking around to see who might be watching me, or making a cool "stupid scooter tricks" YouTube video. I stayed on the scoot yet again, left the battery turned on and gave it a hard push with my feet. THIS time once the battery came back on I kept going before I turned around and gave myself a running start as I tried the incline again. I'd also let go of the cart so I wasn't dragging that extra weight. Success! 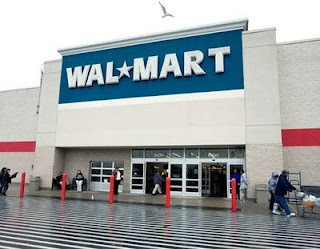 Wet, but no worse for the wear, I headed back into Walmart and did another round of shopping. By the time I checked out the second time, I was just about dry. Unfortunately it was still raining. Oh well! I did my grocery shopping yesterday, this was my third trip with the TrolleyBasket. This time at checkout another nice lady behind me in line offered to help me get the items out of the TrolleyBasket onto the counter. Lots of nice helpful people out there. Anyway after all the items from the TrolleyBasket were on the counter I took my totes off the TravelScoot and placed the full totes on the counter. When the checker started to scan my items I told her that all the loose items needed to go back into my TrolleyBasket and the items in the totes needed to go back in the totes. She understood my "master plan" and things worked out great. She commented that the TrolleyBasket was a handy little cart and she wanted one. I told her they are available online and that they are made for grocery stores. She liked the idea. When I got to my car I was able to fit the full TrolleyBasket in the trunk with my other full totes and the TravelScoot. I probably had about 45 pounds of groceries in the TrolleyBasket so it was a bit of a lift but not too bad. [Today] I zoomed around on the TravelScoot in the mall, and because the elevator was broken from the parking lot in the basement, I got off the Scoot and rode the Travelator, which is a moving ramp, like an escalator without stairs, and the Scoot was easy to just hold onto as I rode up. Later in the day, we drove to the National Gallery of Victoria, an art museum that is free, except we had to pay for the Dali exhibit, which was so interesting. He was so interesting, many of the paintings were amazing, but I am not sure what I make of the whole body of work or who he was. But never mind. it was wonderful to see so many works in one place, tho the docent was awful, so we just hung back and waited for her to take her group onward. ugh. The Scoot was perfect for the art gallery. start, stop, look, read, closer, further. just perfect. It was raining when we left the museum, which is good, as they've had a 13 year drought, so back we came, and here we are, listening to the rain. Thai food from around the corner tonight. Life's tough. To summarize, Kay has talked to her insurance company three times. First they told her she needed her doctor's office to call to pre certify. Next they told her that was wrong, that they needed a letter of medical necessity, which she got. Then they told her that that was wrong and they needed her doctor's office to call to pre certify. The news today is that her doctor's office has called to pre-certify. The insurance told them it wasn't a covered item. It seems to me that she's getting a run around from the insurance company. How frustrating! According to jetBlue's website, you can ride your scooter all the way to the gate. 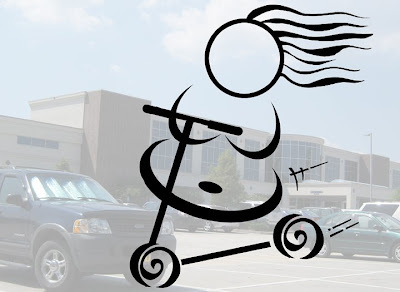 We transport all types of personal wheelchairs including folding, collapsible or non-folding manual wheelchairs, battery-powered wheelchairs and scooters, and other assistive devices. 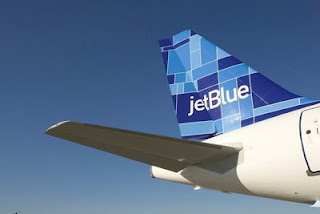 JetBlue will accept battery-powered wheelchairs (unless it is a folding model) and mobility aids as checked baggage only. Battery-powered wheelchair batteries are not permitted in the cabin. JetBlue Airways accepts both spillable and non-spillable batteries in wheelchairs and mobility aids. However, respirators and ventilators are required to have non-spillable batteries only. Batteries used for assistive devices require labeling: the outer packaging must be plainly and durably marked “NONSPILLABLE” or “NONSPILLABLE BATTERY” or "SPILLABLE BATTERY" so that crewmembers can exercise proper handling procedures for the different battery types. In addition to collapsible assistive devices which can safely fit in an overhead compartment or under a customer's seat, one folding, collapsible or break-down wheelchair per flight may be stowed onboard the cabin. This is determined on a first-come, first-served basis at time of check in. 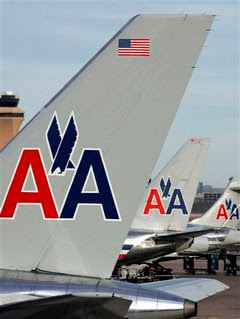 The following information was copied from the American Airlines website. Click here for the link. If you are going to be flying American, I suggest you go to that page and print it out so if you encounter problems you can show the AA employee the information from their website. The most important piece of information on this site (in my opinion) is that they state that a scooter or wheelchair may be checked at the GATE. This is where some folks (Lynn Ellen) have problems. Canes, walkers, CPAP machines and other assistive devices capable of being collapsed small enough to fit into approved overhead and under seat stowage areas are welcome and do not count toward your carry-on item limit. They must be small enough to be stowed in such a manner as not to protrude into any seating row floor space or main aisle. Items such as seat cushions, detachable control boxes, armrests or footrests may also be carried on board with you. Assistance stowing carry-on baggage that meets baggage limits is available for customers with disabilities who request extra assistance. Due to storage limitations, some equipment or devices may have to be checked as baggage if it is not required during flight. 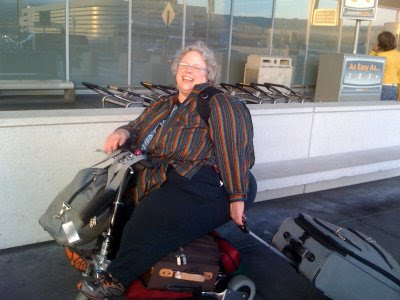 All assistive devices must be packed separately from normal baggage to avoid baggage charges. American Airlines (and American Eagle jet aircraft) has a designated closet space in the cabin of each aircraft to accommodate one collapsible wheelchair. 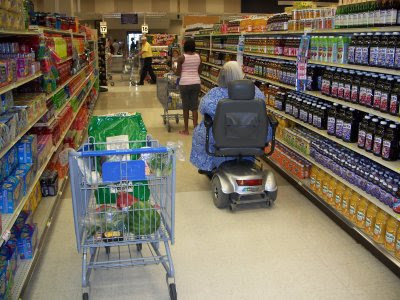 In most cases, more than one wheelchair can be accommodated, provided the space is available. This space is available on a first-come, first-served basis. Additionally, some wheelchairs can collapse to fit either in an overhead bin or beneath a seat. Non-collapsible wheelchairs or scooters are acceptable as checked luggage. These items may be checked in at either the ticket counter or the departure gate. Non-collapsible wheelchairs and other mobility assistive devices are accepted as checked baggage. These items can be checked in at the main ticket counter or at the departure gate. We ask customers with battery-powered wheelchairs to check in at the main ticket counter at least one hour prior to departure to ensure proper boarding of the chair. We make every effort not to disassemble a wheelchair or scooter; however, the small size of some airplane cargo doors and the contents of some batteries require disassembly. For that reason, it is helpful to have the assembly and disassembly instructions with you, as well as any specialized tools that may be required. For safety reasons, we must examine all batteries to determine proper handling. For all batteries not labeled by their manufacturer as 'non-spillable', and for wheelchairs which cannot be loaded, stowed, secured, and unloaded in an upright position at all times, removal and airline dangerous goods packaging procedures apply. For disabled passengers, there is no charge for transporting wheelchairs or for the use of courtesy wheelchair services. If you are a customer with a disability and have recently experienced a problem on a previous trip, we invite you to call us directly at (817) 967-3000. Please provide your full name, a daytime phone number, and mention that you are calling to discuss a disability-related matter. We will return your call no later than the end of the following business day. For disability assistance on a current reservation, please complete the Disability Assistance Form. When I checked in [at the airport], they told me I could not bring the scooter to the gate, as they didn't get that it is light weight enough for them to take away like they did the baby strollers, so I left it at baggage check in and got a wheelchair ride to the gate. But the international terminal at that hour was fairly quiet and not at all frantic. 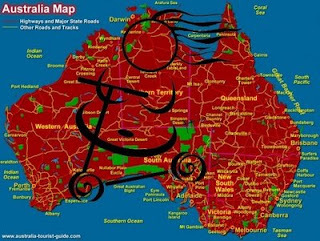 In Sydney, I got my bags and my scooter, assembled myself and went through customs with no problems. then I had to check my bags again, and the scooter again, go through security, take a bus to the domestic terminal, and board the flight from Sydney to Melbourne. I was reunited with my scooter and bags, scooted onto the shuttle bus, and took that downtown, where I was met by friends. Delightful. The scooter easily fit in the back of her car. I haven't had many experiences yet using my scoot in crowds. I was careful to move slowly, but learned that I need to be more alert when I'm backing up. 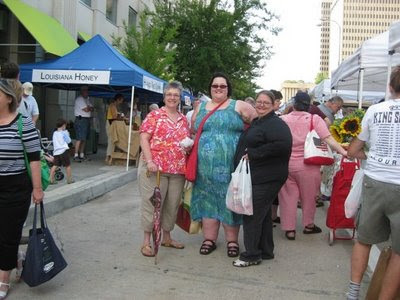 I hadn't realized what a social event a farmer's market could be. We ran into two ladies from our exercise class, and one of my coworkers was there. I don't know why I have concerns over how people are going to react to the scooter OR me being sleeveless because they really just don't. He was happy to see me and introduce me to his companion. 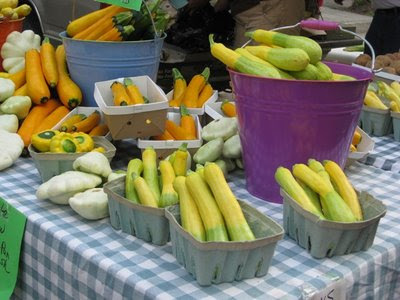 Now all I need is some white bread, bacon and lettuce for a BLT! Mark took bronze in sparring at his taekwondo competition. Go Mark! Lynn Ellen just reported in from the airport. She's starting her journey to Australia. She says she is "Self-contained with 2 suitcases and 2 carry-ons with Scoot". This is an amazing picture. Cynth, I think she's carrying more on her TravelScoot than even you have managed! Rhonda, hubby Dave, and son Mark traveled from Baton Rouge to Birmingham, Alabama for a Taekwondo event for Mark. Of course Rhonda took her TravelScoot and didn't make it through the first breakfast (just this morning) before she had people asking questions about it. accosting people, I think that I'm just tuned in to their interest." 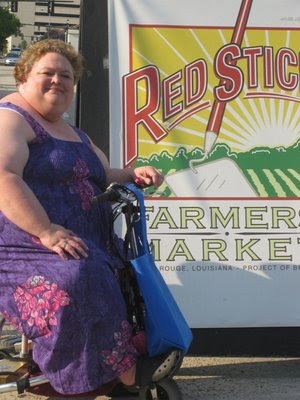 The picture to the left is Rhonda's scoot saying, "This is what I want to be when I grow up!" Dave says he's sorry the focus wasn't better. His Blackberry was feeling a little shaky. Rhonda says you need to make the grunting noise that "Tim the Toolman Taylor" used to make when you view it. We're not sure what the other vehicle actually is, but it looks like a Segway with a third wheel. The BJCC on the side is short for Birmingham Jefferson Convention Complex. She looked like a kid on Christmas morning as she flew through Target. It was her first ride on a TravelScoot, and it didn't take long to see it as a manageable way to ease the pain associated with walking long distances. "She" is my sister Kay, who lives in New Jersey and works in New York city. Her commute begins with a long drive to the ferry, then there's the hike from the parking lot to the ferry, and once the ferry lands there's a seven-block trek to her office. Every evening is a repeat of the same process. Can you imagine doing this 5 days a week? And can you imagine doing it when a medical problem makes it very painful to do so? 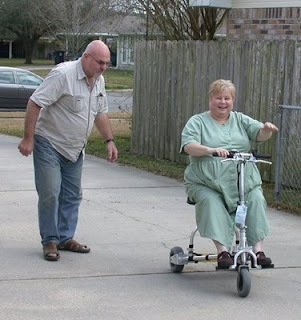 One of the benefits of Kay's insurance plan is that they cover medically necessary mobility equipment. What they don't mention in the plan documentation is how hard it is to navigate the process to get this equipment. On this blog we're going to follow her progress, which hopefully will soon come to a successful conclusion. Call #1) The customer service rep told Kay that she needs to have her doctor (or a representative from his office) call and give pre-cert information. Call #2) Kay called to get additional information about call #1, only to be told that she was given incorrect information during call #1. What Kay needs to do is to ask her doctor to write a letter of medical necessity, which he did. Call #3) With the letter of medical necessity in hand, Kay calls the insurance company again to find out how to proceed, only to be told that she received incorrect information in call #1 and #2, and that her insurance does not cover scooters. Maybe wheelchairs, but not scooters. When Kay questioned her, at some point the rep said, "Oh, is that a motorized scooter?" She wouldn't admit that she'd been wrong when she said they didn't cover scooters, but she proceeded to tell Kay that she needs to have her doctor call and give pre-cert information. We're still in the middle of the story, but as new information emerges, I'll be posting it here. If you have tips, tricks, or advice to share, or if your insurance paid for your TravelScoot, please post comments here about it or email them to me at elizabeth@ifisher.com. Thanks! Rhonda called me today to tell me what happened to her at work. It seems that the lady who told Rhonda she doesn't approve of scooters is softening her attitude. She sped up walking so she could open the door for Rhonda AND she smiled back at her. Hopefully this signals a change of heart. Later, when Rhonda was near the elevator in the parking garage she encountered four casually dressed young men who moved to the side to let her pass. One of them approached and politely inquired about her scooter. It didn't take long to figure out his ulterior motive -- he realized it was just what his granny needs. She has complications from diabetes and struggles to put a wheelchair in and out of her back seat. 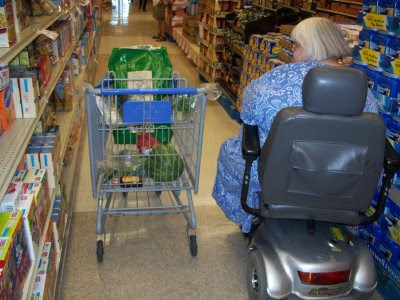 (If you've ever put a full size wheelchair in or out of a back seat, you'd know WHY she struggles. Those things are heavy and clumsy.) This is obviously a young man who loves his grandmother. He got on the phone with his mom and told her to go to TravelScoot.com immediately. He asked Rhonda how she gets it in and out of the car, and then asked if he could follow her to her car to watch. After watching her fold it up, he asked if he could try. He practiced unfolding and folding it and said that his granny is pretty strong, and he thinks she can do it. He said he'd just have to clean out her trunk so it'll fit. Here's the great part. His grandmother is about to retire and have a big birthday and the family has been saving up to buy her something big, but hadn't decided what it will be. He said they didn't have quite enough for a TravelScoot, but he wanted her to have the li-ion battery and was willing to work extra shifts to make more money to contribute. This young man's family has good reason to be proud of him for being so thoughtful. He and Rhonda were also in the right place at the right time. She was leaving work and he was there with a friend who was paying a speeding ticket. I'd love to know how this story turns out, but every time I talk to someone who approaches me about my scooter I want to know how the story turns out. I'm sure it happens to you all too, but I've talked to some of the most caring people. Last week Rhonda and I saw a man sitting at the front of Hobby Lobby, and it seemed to me (mostly from the way he was sizing up our TravelScoots) that he was sitting there because walking from the parking lot was about as far as he could go. He struck up a conversation with us and was amazed at how lightweight yet powerful our scooters are. Another man and his friend approached us. It's touching to me how you see a light in their eyes, like they've found something they didn't even know they were looking for. His wife can't really even walk in her home very well, and while she's able to get to work, can't shop or have other fun adventures. He couldn't have been more enthusiastic. What's hard is hearing someone say they could never get their loved one to use a scooter. I do understand the feeling of stigma, but it's like the first time you go sleeveless in public. Most people really aren't paying as much attention to you as you think, and those who look do it briefly and look away. When I catch someone staring when I'm scooting I give them a big smile and say, "cool, isn't it!" I know the young man Rhonda talked to today has this blog address, so if you're reading, let us know how things turn out! Either Rhonda or I would be happy to meet you and your family at Target to let you try one of our scoots and to answer questions, or I'd be happy to answer questions by email, elizabeth@ifisher.com. I went to the grocery store Saturday and took the TrolleyBasket along with my TravelScoot. It really did work so much better than just my totes. There was a sale on meat and I was able to buy enough to restock the freezer above my fridge. The TrolleyBasket holds a lot of items when arranged for maximum capacity. The TrolleyBasket was as easy to pull full as it was empty. The only real challenge came at checkout time. A very nice lady in line ahead of me offered to help me unload my TrolleyBasket, so that part was cool. But the problem (at least my percieved problem) was how the checker bagged my groceries. I asked her to put all the meat into my largest tote (as it is the same size as the inside of the TrolleyBasket) so I could then put that tote into the TrolleyBasket. I asked her to put all my other items into another tote (which I had them all in and attached to my hooks). She spread the meat out into grocery bags and both my totes, apprently I was not clear enough as to what my "Master Plan" was. Anyway both the canvas totes ended up weighing more than I felt comfortable hanging from the hooks on my TravelScoot, so I had to have help out of the store (which is fine, but I don't like it lol). The TrolleyBasket was nice to have to pull the heavy totes into the house with. When I first ordered it I thought I would only use it when I needed to buy heavy items, but I think I will be taking it in with me most everytime I shop. It really was nice to be able to stock up on sale items and not worry about putting so much weight on the hooks of the TravelScoot. They are talking about buying me a laptop computer at work to replace my desktop system. I work from home two days a week and currently just use my home PC to log into the network at work. They want us to use company equipment to log into the network and that means I will have to carry the laptop back and forth from home to work a few times a week. I think the TrolleyBasket will be put to use for that too. I carry my TravelScoot battery and my paperwork in a large tote, adding a laptop to that I am afraid would aggravate my back. I have one of the Pack-N-Roll file carts that I used to use to carry my things in and out of work with, but the TrolleyBasket is smaller and easier to fit into the trunk (or backseat) than the Pack-N-Roll. To see a video of Cynth using the TrolleyBasket with her TravelScoot, click here. I purchased an SLA battery for my TravelScoot to use as my second battery. The advantage of having the SLA battery as a backup is that I can leave it in the trunk of my car and if I don't have my lithium ion battery with me, I can still use my scoot. I also like having it available in case I'm by myself and I overload my lithium ion battery and can't get it restarted by myself. I put the battery in my trunk on Monday, June 22nd. 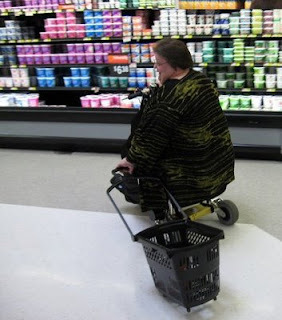 I used it for a short shopping trip at Walmart, a couple of trips to visit my mom's nursing home, and to demonstrate my scoot for friends in my exercise class. 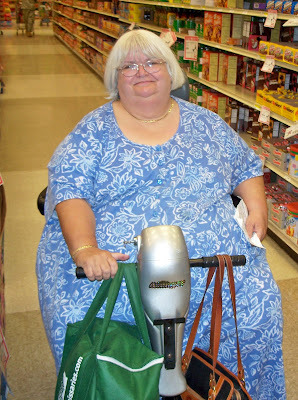 On Friday, July 3rd, Alan and I took my scoot to the grocery store. We hooked up the SLA battery and sat the lithium ion battery on top of it (the opposite of how it is in the photo), in case the SLA battery pooped out on me in the store. On the way into the store the battery display went from green to amber when I was going up the incline into the store, then it went back to green. As we went through the store it went from green to a steady amber. We stayed in the store long enough to buy almost $300 in groceries and misc. supplies. By the time we left the store the display went from amber to red. I was still able to drive it out to our van and use it to take the shopping cart back to the store. I never had to use the lithium ion battery that day. Judging from this test, it looks like I'll need to charge the SLA battery about every 10 - 14 days, depending on how much I use it. I imagine it also loses some charge just from sitting in the trunk. The SLA battery weighs 20 lbs., but it's easy to lift because of the handle on the fabric pouch. I still prefer the lighter-weight lithium ion battery for regular use, but I like having the SLA as a backup. Hardy has a page on his website that explains the differences in the batteries. It's at http://www.travelscoot.com/batteries.htm. My original post about the SLA battery is at: http://mytravelscoot.blogspot.com/2009/06/sealed-lead-acid-sla-battery.html. Comments on "Coming out as a Scooter Babe"
I am so happy you used your TravelScoot to go to the doctor. I keep being amazed at how often we have those events where we are hesitant and then find out that there was no reason. Your post was great. Hopefully it will reach a few of the people who are holding back because of what "other people" will think. I know, I would have ordered mine several weeks earlier than I did if I hadn't been hesitant about other people's opinions. Even when I told the nurse- practitioner about it, I did it in an e-mail so I wouldn't have to face her in case she didn't approve. Once again, that wall came down. I think our families and we are our "worst enemies" because no one else really seems to care. I think the people who stare and/or snicker at us on our scoots were doing it when we were on our feet also, we just have learned to not notice it. oh elizabeth, mine was going to the club. we live next door to it but i always had to drive as i could not walk that far. i am younger than most of the members and being heavy (most of them are tiny old people, you know the ones). sarge would want to go play poker and i'd want to go to the club. he'd drop me off but i'd have to sit there over an hour to wait for my ladies. if only i had the nerve to ride the scooter! finally one day i did it! i parked it out back by the door and got off and walked in. on one said a word! now i ride over most every day! wonderful. i never worried about riding on a cruise ship because i didn't KNOW those people, you know? now i wear my tiara and go! There is a few seconds of unfounded fear for me every time I open my trunk to take out the scooter. But I have that same few seconds of unfounded fear anytime I know I will be in a group of people that I don't know. Which in Boise is all the time since I don't really know very many people here. I have never had anyone say anything rude to me while I have been scooting. No one has said anything negative to me about using a scooter. In fact my family was happy I "finally" got a scooter. The only possibly negative experience with the scooter was in Target when I caught a 17-18ish year old looking girl taking pictures of me with her camera phone... now mind you I have no idea why she is taking the pictures but when I looked at her she started pretending she was doing something else. So I picked up my camera phone and aimed it at her and acted like I was going to take her picture. The look on her face was priceless I wish I had actually taken her picture. She dropped her head and RAN to the next isle where I couldn't see her. It was kind of scary the first time I used my scooter at work. But yet again people proved me wrong. Everyone said positive things about the scooter if they said anything at all. 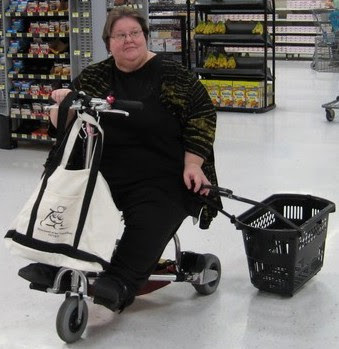 This ties in with the "Elephant in the Room" post where I asked "Why are there so many well-meaning loved ones with unreasonable fears of the use of mobility aids?" but this post addresses my own unreasonable fears instead of theirs. It's time for me to come out of the closet as a "scooter babe". Let me explain. Many years ago my friend Daphne told me that I deserved as much room as I needed in order to be comfortable. For her it meant that if there wasn't a comfortable chair, well, she'd spread out on the floor. When she led our Women of Size Fitness classes, she'd tell us to move around and take up as much space as we could while we danced around the room spreading our wings. For someone who'd been trying to take up as little space as possible since grade school, it was revolutionary. I came out of the closet at as fat woman and stopped trying to hide. It was a defining moment. Lately I've reached another defining moment -- realizing that to grab the gusto in life, I need my wheels. Coming out as a fat women involved surrounding myself with positive images of fat people and immersing myself in the size-positive community. Coming out as a scooter babe means getting people accustomed to seeing me using a scooter, and getting myself accustomed to using it in new situations. I rode through the surgery waiting area, and into the crowded ENT office to sign in for my appointment. I got off and sat in a chair, but turned my scoot so it'd be facing the right way to go to the exam room. The woman who showed me to the exam room said "cool scooter" and proceeded to get medical information from me. The doctor was more interested in getting me feeling better than my scoot, and he sent me off for a pulmonary function test. The woman who administered the test made positive comments about it, but none of the staff ever acted like it was anything unusual for me to be riding it. (Maybe I'm not the first person to come into this VERY busy office using a mobility aid? Go figure!) An added bonus was that when there was no suitable chair for me (in the testing room, and in one waiting area), I stayed on my scoot. No one in the pharmacy treated me any differently as they filled my prescriptions to treat a sinus infection and asthma. I rode down the elevator again, through the lobby and out to my car. While I was folding my scoot, a nice man stopped and asked if I needed help (I didn't), and before I knew it I was on my way back home. Has there been a moment of unfounded fear for you? Is there something you're dreading? Is it time for you to come out as a scooter babe? I hope you'll step out of the closet with me. It might be scary for just a minute, but the feeling on the other side is euphoria! 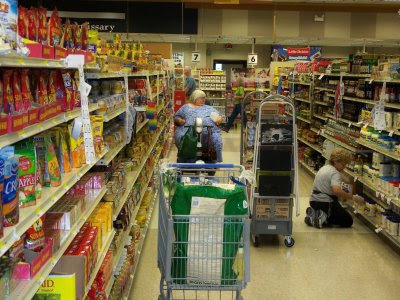 This is a typical shopping day for Jackie and Chris at their local food store. Jackie has an Avenger scooter, made by Golden Technology. Here's a link to a review on the USA TechGuide website. One thing I notice in these pictures is that nobody seems to be paying any attention to the scooter (or even the picture taking). I think sometimes we assume everyone is looking at us, but that's not the case. I'm going to talk more about that in my next post, when I talk about my doctor visit today. I took my TravelScoot! The TravelScoot might not be the ideal scooter for every supersize woman, so from time to time I'm going to talk about other scooters that are working out well. This post is about Jackie and Chris, two long-time friends I met at a NAAFA convention MANY years ago. Jackie uses an Avenger scooter. This isn't her first scooter, so they bought this one after they'd had experience with other scooters. I asked Chris if he was the designated lifter, but he said no, they use a lift that's on the back of their truck. He's is going to send me pictures of the lift in action. The Avenger scooter is manufactured by Golden Technology, and with a weight-capacity of 500 lbs., it's a heavy-duty scooter designed to handle extra weight, uneven terrain at speeds up to 7 mph. The scooter itself weighs 190 lbs., so you'll need a lift and a vehicle large enough to carry it. Is anyone else curious about where Jackie got that beautiful dress?